Tickets are on sale for the 8th Annual Heart of Summer Fundraising Dinner and Auction. Tickets are $40 person and includes dinner, wine, beer and chocolate tastings, along with a lively silent and live auction. All funds raised at this event will help to cover cost of providing vital hospice services to the community that are not reimbursed by insurance. 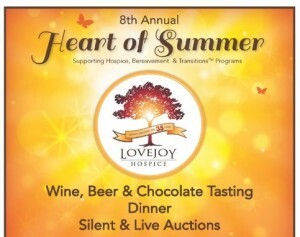 Tickets can be purchased on-line at www.lovejoyhospice.org, by visiting our facility at 939 SE 8th St, Grants Pass, OR or by stopping by Judy’s Grants Pass Florist & Gifts, located at 135 NE Steiger St, Grants Pass, OR.